Are you ready to add value and a beautiful AZEK composite deck to your Arnold home? Freedom Fence and Home is here to help. You may want to attach a deck to your Arnold home, but you’re probably hesitant about doing so because of the maintenance most decks require. With AZEK Composite Decks, however, you spend less time working on your deck and more time enjoying it. If you haven’t heard of AZEK, let’s take a journey through the wonderful world of composite decking. A wooden deck generally has a lifespan of 10-15 years, which isn’t very attractive if you plan on staying in your home for several decades. Composite decks are known for their durability because they are not vulnerable to the same issues as wooden decks. Wooden decks are susceptible to rain and snow, which can cause mold and mildew. An AZEK deck, however, won’t wear down because of the weather. Composite decks are also resistant to terminate and other insect infestations. New homebuyers do not want to fix a deck that is almost in ruins. They also don’t want to deal with the painting, staining and other maintenance that wooden decks require. Having a composite deck is a huge selling point because of the minimal maintenance. More and more homebuyers have a composite deck on their checklist when searching for homes in Arnold. If you have a young family, the last thing you want is your child injuring themselves on a warped or splintered board. AZEK decks will not splinter, and most composite decks offer some sort of slip resistance. Pets are also known to have issues with splinters sprouting from wood, but composite decks will keep everyone safe. AZEK is certified by the company that makes it with a lifetime guarantee, and the material can be recycled when it comes time for it to be replaced. Are you ready to add value and a beautiful composite deck to your Arnold home? Freedom Fence and Home, which services the Arnold area, provides deck construction for homeowners who want to improve the look, and value, of their homes. Our crews are highly trained and have been performing deck construction for years. You can view our gallery to familiarize yourself with our work. 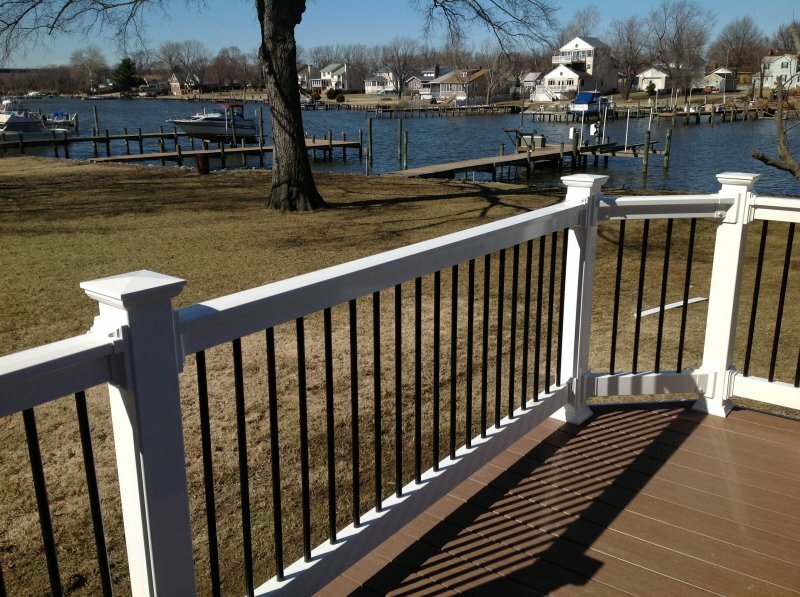 If you have any questions about AZEK Composite Decks, please contact Freedom Fence and Home by calling 443-271-6841 or visit our website. You can also follow us on Facebook and Twitter! This entry was posted on Friday, August 21st, 2015	at 7:41 pm	. Both comments and pings are currently closed.